Home Run is a novelization based on the movie Home Run coming out in theaters April 19th. I love to read the book before the movie. This is a case where the movie was made first, then the book written.. giving some liberty to Travis Thrasher to add details and go more indepth where the movie just didn't have time. I am so excited to see the movie after reading this novel. Travis Thrasher did an excellent job with the story, one that hits home in far too many families across America. Cory Brand, major league baseball player, troubled by his past with life of an alcoholic, abusive father. Cory is heading on the same road his father did, yet he doesn't even see it. His father lost his baseball career and turned to drinking. Cory started drinking to drown his feelings and to prevent the past thoughts from creeping in. Cory however doesn't see the addiction as a problem. He spends a great majority of his life in a drunken stupor, causing his baseball stats to plummet, and his behavior to be prominent on the news. His behavior gets him sent back 'home' to Oklahoma, for a 12 step program, on suspension from playing ball. Part of his restitution to coach the little league team where his newly adopted nephew is a team member. Cory has all of the support he could need for a full recovery from his addiction, if he can realize his need for God, and to give up the alcohol. 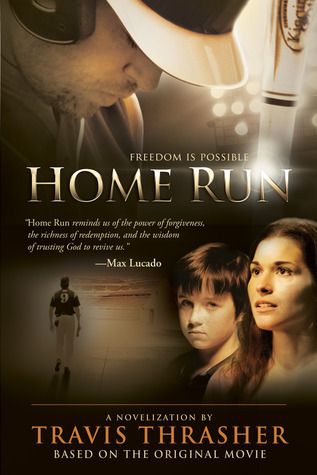 Enter to win a copy of Home Run ! Use the Rafflecopter form below and be sure to check out the upcoming movie to see if it is coming near you! Thanks for the giveaway. I saw the movie (before final edit) here in my hometown with other media reps and ministry groups. It was excellent. I can't wait to catch it in the theaters. I love Travis Thrasher. I would love to see how they novelized the film.